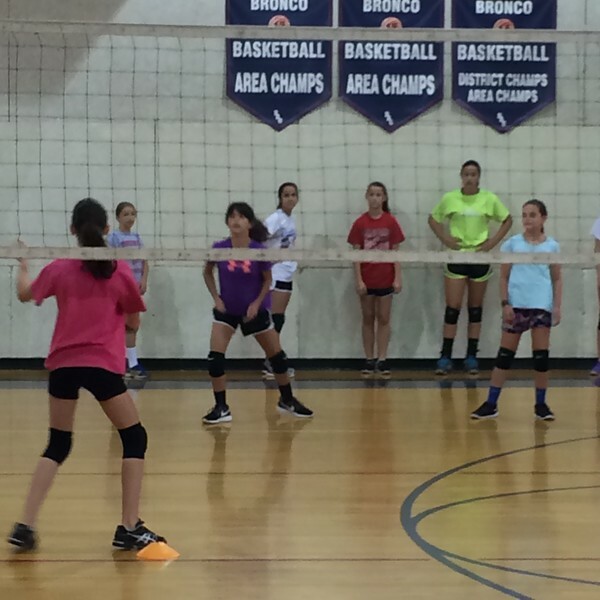 Annelise is going to volleyball camp this week at her school and here is a terrible photo to document said event (she's in the purple shirt). It's one of those typical tween situations where she balked and complained and refused and so forth every time we talked about her going in the weeks leading up to it and then walked in the gym yesterday morning to find a handful of her friends there and was as happy as a clam. It would be immature of me to tell her I told her so, wouldn't it? In related news, she's had a flurry (ish) of social activity lately, which has been quite the treat for her. Last Thursday she went to a friend's birthday party where they played, made a few spa type things and swam. I guess I've gotten used to her wearing her bikini this summer (remember, this is a new thing) and do think it's a modest two piece with a ruffled halter style top, so I really didn't think twice about her wearing it to a girl's birthday party. As it turned out she was the only girl out of 6 or 7 wearing a two piece and it was a little awkward, not so much for her, she got over it, and maybe it was my imagination (fingers crossed) but I worried the other moms (moms I don't know that well yet) have now pegged me as an overly permissive mom that allows her daughter to be immodest and I am so not. Well, except for her bikini. Friday morning, since Scott was off from work, we went to breakfast at The Egg & I, which you know is a favorite, even though that meant Annelise couldn't sleep late. We then met Grace at AcroSports for an open gym which was fun. Annelise went home with Grace for a sleepover and had, as always, a fabulous time. In completely unrelated news, Scott and I (and Annelise in fits and starts) watched all, yes, that's right, ALL the Rocky movies over the last few weeks. Neither one of us had ever seen them, except maybe snippets over the years (although I may have seen Rocky IV in the theater years ago) so we sort of just jumped in (Rocky I-V are all on Netflix streaming, how convenient). While not the best movies ever, there is something captivating about an underdog and Rocky and Adrian's (yo' Adrian) love story/marriage is really sweet. My favorite parts of each of the movies are when Rocky is training and of course, the fights. Duh. Rocky V was our least favorite, like, it was terrible and we both thought the last one (Rocky Balboa) finished everything up for Rocky nicely. Last night the Girls and I went out for supper at The Cheesecake Factory, which is always our go-to place. We always get the same thing, four Factory Chopped salads (two without tomatoes), four tropical teas, three coffees and two cheesecakes to share (the flavors vary). Last night we told the waitress that we would be an easy table. I don't know if it's because we ordered the Skinnylicious Factory Chopped instead of the regular, although I thought they were basically the same, but maybe not, or there was a new salad guy or what but they were not up to snuff. Whatever snuff is, my grandfather used to say that and I still don't know what it means. Now we are not difficult people. Really. We don't complain, we don't send things back, we are not ones to try and take advantage. Really. Like ever. But our salads were smaller, they were missing the avocado and the chicken was, um...burned. And we spoke up. But politely, I promise. The waitress was so nice and apologetic, even though it wasn't her fault, and then the manager was very nice and apologetic and generously offered to take the salads off our bill. He later stopped back by our table and told us he was treating us to our cheesecake too. We protested and told him he didn't need to do that and he told us we weren't the boss of him. But I still feel strangely guilty because I know that there are people that deliberately start a fuss in restaurants just to scam free food and I would NEVER want to be lumped in with them, because that's SO not us and I am slightly mortified that the waitress and manager might think we did that. We really just wanted the avocado that was promised to us. But the rest was really nice too. What awesome Cheesecake Factory customer service! I'm usually not one to complain, either, but sometimes...ya just gotta! It was very popular in the 16, 17 and 1800s; it was the smoking of that time. I still don't get what the saying means, and I have heard it all my life! I should clarify that it was more of a European thing, but they did do it here.